Fears from locals of ‘aliens arriving’, but there is a surprising explanation and, yes, there was an unusual object in the sky. The illuminated ball looming over the forest was seen clearly in the town of Salekhard right on the Arctic Circle, but was also visible over a swathe of northern Siberia in the night sky. Residents from Yamalo-Nenets region reported ‘shivers down their spines’ and the social media went alive with claims of aliens arriving in an awesome UFO. The extraordinary sight was captured by leading Siberian photographer Sergey Anisimov who admitted: ‘At first I was taken aback for a few minutes, not understanding what was happening. ‘The glowing ball rose from behind the trees and moved in my direction. ‘My first thought was about the most powerful searchlight, but the speed of changing everything around changed the idea of what was happening. After the multi-coloured light show was over he went home. Another photographer Alexey Yakovlev spotted the spectacle at Strezhevoi, in the north of Tomsk region, some 840 kilometres away. ‘And at first I thought – it is such a radiance of such an unusual form – round in shape. In fact the reason photographers were out watching the sky was an amazing show of northern lights – or Aurora Borealis – but there was an extra dimension too. This was the launch of a Topol-M intercontinental ballistic missile from Plesetsk cosmodrome aimed at the Kura testing range in Kamchatka on the country’s Pacific coast. The launch was one of several last night in exercises by the Russian strategic nuclear forces, as confirmed by the Russian defence ministry. 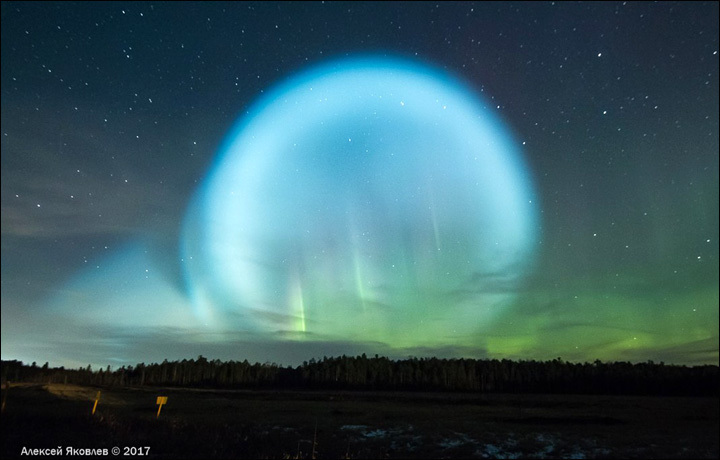 It was the the trace of the Topol rocket – capable of carrying nuclear missiles – that caused this extraordinary phenomenon in the sky. As photographer Yakovlev posted accurately: ‘It seems I accidentally shoot the launch of a secret space rocket from Plesetsk’.